Home » Something for today!!! » Christmas is in the air. This week we got the Christmas decorations up at the school. It is ALWAYS such a wonderful time. Lights! Happy faces! Decorations! The hustle and bustle of the season is what we look forward to. 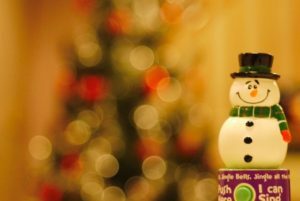 Do you know the difference between Christmas in Japan and Christmas in Canada? Christmas in Japan: A time to go out on a date and to spend with that special person. Gifts are exchanged and romance is in the air. Christmas In Canada: A time to spend with family and friends. Home cooked turkey dinners are on the menu. Gifts are exchanged and opened together as a family. If there is anyone who may be alone at Christmas, friends ALWAYS invite them to spend the day with their family. I hope that you all enjoy the season and make the opportunity to brighten someone’s day. Last time I asked you about the difference between USED TO and WOULD. When I was a child, we used to go to the cottage and we used to go swimming and hiking. When I was a child, we would go to the cottage and we would go swimming and hiking. USED TO is used for explaining a past regular action that is no longer done. It is dry and factual. WOULD is used for explaining a past regular action that is no longer done. It is very nostalgic and reminiscent. It has a warm and happy feeling. When I was a child my mother would make cookies for us to have when we returned home. This is a warm memory. What is the difference between MAKE and LET???? Give me some examples, if you can. Take care and see you again soon.